Another great option for your AR based airsoft replica. 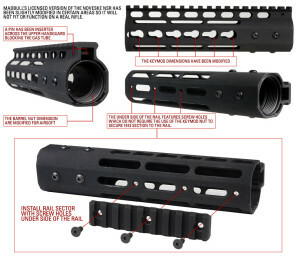 This rail comes in 7″, 9″, 11″ and 13.5″ sizes and are incredibly light. The Noveske NSR rail comes with the Key-mod design allowing you to attach an array of accessories. It does feature several screw holes along the bottom to allow for the attachment of normal rail sections.